All three parts of the series on social media as a new source of requirements data are now published. The first shows how product teams can use social media to create reach more accurate conclusions than traditional sources of requirements (customer visits, enhancement requests, customer advisory boards, etc.) alone can provide. The second document distills the lessons learned from attempts to use social media in this "inbound role" into a methodology, PLOT (persona, location, options, test). Since the choice of which social media can best answer particular kinds of questions isn't immediately obvious, I devoted the third document to that topic alone. Product-centric, which related directly to the company's products and services. How many people have voted for a particular feature is a good example. Problem-centric, which depicts the customer's world. The patterns in how organizations adopt particular kinds of solutions, for example, is vitally important for product teams, even though the best form of that information makes no reference to the vendor, or even the supporting technology, whatsoever. 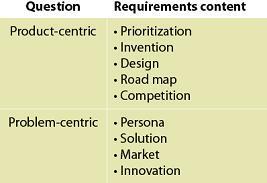 Shown here is a graphic that summarizes the kinds of requirements information that falls into these two categories. To borrow a phrase from William James, the breadth of social media options appears, at first glance, as a "blooming, buzzing confusion." This distinction between product-centric and problem-centric issues is the first of several filters needed to select the right social media outlet to answer a particular question. This distinction is also critical for determining whether the company's current investment in social media can be at all useful for the product team. Already in many technology companies, Marketing's enthusiasm for social media inspires skepticism in Development. In the worst cases, it's almost as if someone were to propose to John Calvin, "The papacy has some interesting ideas about transubstantiation. Why don't we look into them? This product/problem distinction helps decide whether the existing social media channels will be of any use to the product team. In some cases, they certainly will be. In others, either the company will need to build additional social media tools, or the product team will need to look outside the company's web presence altogether.